As its name hints at, the Scanpan Induction Plus Non-Stick Fry Pan is of Scandinavian heritage and this pan definitely exhibits the craftsmanship and attention to detail Scandinavian manufacturers are known the world over for. This fry pan is not only very versatile-it enables you deglaze, sear, or braise food with the same panache and ease as with any stainless steel cookware-it does so with your health in mind. How? This pan’s surface uses a patented compound made of ceramic and titanium for healthy non-stick cooking while retaining superior strength and durability. Besides reviewing its Scandinavian design, we will also look into this Scanpan cookware’s feasibility in terms of optimal long-term value, versatility, ease of use and handling, ease of cleanup, and overall durability. Using a patented mix of Titanium and ceramic elements, this 10.25 inch pan is not only able to offer a great nonstick surface that is fully PFOA-free but it does so in one robust package. Just how tough is the Scanpan Induction Plus Non-Stick Fry Pan? It’s been rated as 10 times tougher than steel. If you’re worried about using metal spoons and utensils, don’t. You can stir away and not have to worry about scratching this pan’s non-stick surface. Made with environmental concerns firmly in mind, this unit is made from aluminum that is 100% recycled. Still, you can rest assured that its titanium ceramic blend will deliver solid and even heating capabilities throughout its lifetime. You are assured of consistent cooking experience with this unit. Best of all, its compound constructions ensures a long product lifetime thereby guaranteeing more value for your money. This pan comes with a limited lifetime warranty. 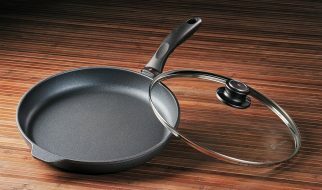 Given the construction of this pan and its components, it is no surprise Scanpan is so confident about its product’s long-term quality that it offers such a long warranty on the body and nonstick components of this pan. Tough yet light, this pan is designed to help you prepare food in a healthy greaseless way for a long time to come without having to worry about it falling apart or its non-stick surface scratching away. Thanks to squeeze casting, this mostly aluminum pan offers a very strong unibody form that doesn’t fall apart with repeated use unlike other induction cookware that use spun metal alloys. There’s little chance the heating disk would fray because this pan’s main body is cast in one piece. You get a great combination of light, easy, health conscious cooking with no worries regarding the durability of both its surface and body. If you’re trying to maximize the value you get out of any cookware, you would want to use it to prepare food in as many different ways as possible. You would try to make it your ‘go to’ pan to cook a wide range of dishes with different heating requirements. Sadly, not all pans are up to this wide ranging use. You can use them, sure enough but you can also be sure that they won’t last under the pressure-either their nonstick surface would scratch away or their body would not be able to handle the punishment. Unlike its competitors, you won’t have any problems with this Scanpan induction pan regardless of what you feel like cooking. Deglazing? No problem. High temperature searing? No biggie. Braising? Consider it done. This Scanpan’s solid squeeze casted aluminum construction paired with its ceramic and titanium heating disk construction delivers solid yet even heat distribution time and time again. Thanks to its mostly aluminum construction, you would not have to hassle with the weight and range of motion issues you might get with heavier mostly iron or stainless steel induction cookware. You can easily move this pan around your induction cooktop since its 2.8 pounds won’t weigh you down. While it is a bit heavier than ultra lightweight induction cookware, you are assured that this pan lasts much longer due to its robust construction and solid design. You get the light flexibility and ease of handling aluminum brings while you get the longevity solid-casting delivers. On top of this already amazing combination, you get superior non-stick performance that is so durable Scanpan is offering a lifetime warranty on its non-stick surface. In short, this induction frying pan gives you the heavy duty durability you’re looking for while ensuring you can prepare almost any dish without heavy lifting or breaking out in a sweat. You can toss ingredients while you cook. You can even put this pan in an oven. As long as the heat setting is 500 degrees or less, this pan delivers solid and reliable performance regardless of the heat source. Now, that’s versatility. This pan’s patented ceramic surface not only provides a healthy non-stick alternative, it also ensures that cleanup is a breeze. You don’t have to worry about debris build up. You only need to run the pan under cold running water from your faucet, wipe it down in a couple of strokes with a sponge dipped in soapy water, quickly rinse it again, and you’re done. Quick and easy. Say good-bye to scrubbing ‘non-stick surfaces.’ In fact, Scanpan is so confident about this model’s ability to maintain its surface quality even under prolong use that this unit’s non-stick component comes with a limited lifetime warranty. Let’s face it, many pan models seem to be designed for almost disposable use. From easy to scratch non-stick surfaces to handles that come loose to composite alloy heating disks that fray, there are too many induction cookware products that simply aren’t built to withstand the test of time. The Scanpan Induction Plus Non-Stick Fry Pan is, thankfully, not one of them. This unit, let’s just be clear, is built for the long haul. In fact, its surface is so strong that it is ten times tougher than steel. How’s that for durability? 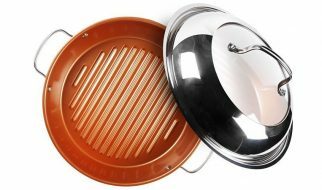 Also, it’s squeeze cast aluminum design guarantees you’ll be able to enjoy this model’s highly versatile nonstick cooking virtuosity for many, many years without having to worry about its main body coming apart. While this model does cost a bit more than other induction cookware, you do get more than your money’s worth-versatility, non-stick strength, durability, and easy handling. Indeed, this model can easily pay for itself due to the fact that you probably would have to wait a while before you should replace it. Compare that to the nearly disposable nature of many other cookware models out there.